You can remove the surface scratches on the back of an iPhone case by using a mildly abrasive rub or fine sandpaper. The anti-scratch coating is actually where many of the smaller finer scratches on iPhones are shown, which makes them relatively easy to buff out with some care. Whether you are using the toothpaste or sandpaper method to repair the scratches, you will want to be careful as to not rub the anti-scratch coating off of the iPhone case. Warning: Try these methods at your own risk! We are not responsible for you damaging your iPhone in any way, and if you are not confident in your ability to do it right, you should probably avoid the techniques altogether! This might sound totally crazy but believe it or not you can use tooth paste intended for sensitive teeth as a mildly abrasive rub and it’s able to get out some of the finer scratches on iPhone cases. * Leave the toothpaste on for a minute or two to dry a bit. You may need to buff the iPhone scratches for a while to get the best results. Many of the finer scratches that are just marks on the surface coating will come out using this method. People use a similar technique to remove scratches from things like DVD’s and CD’s, and unsurprisingly it works quite well on the iPhone’s plastic case. To make this method even more bizarre, you can find recommendations on following up the toothpaste with a banana rub, but I haven’t tried that myself. Some people use a product called Brasso too. Be sure you do not get any toothpaste into any of the ports or openings on the iPhone! Any moisture can corrode internal electronics and void your iPhone warranty by triggering the spill detectors. You can use a fine grit sandpaper to buff out and remove many of the smaller scratches on an iPhone case too. It’s a method very similar to the toothpaste, but you’ll want to be cautious to use the right kind of sandpaper, 1200+ grain seems to work well based on various recommendations and experiences around the web. You’ll end up spending 30 minutes or more to really make it look good, refer to the MacRumors Forum thread mentioned below for an example. Do not rub too hard! Remember, you are trying to just polish the scratches out of the surface coating of the iPhone. If you remove the surface anti-scratch coating, you will have to use the below method which is much more intense. If you are really committed to completely removing every possible scratch from your iPhone, deep gashes included, you can use a rather intense process of drysanding, then wet sanding, and finally polishing the iPhone to restore the case to it’s original glory. It’s not exactly a quick and simple process, so I’d only suggest this if you’re truly committed to restoring an iPhone’s case. It will also remove the Apple logo and all text from the back of the iPhone case, so be aware of that. This post on MacRumors Forums: Restoring an iPhone Front & Back is invaluable, and even includes a guide to fix screen scratches (requires iPhone disassembly, not for the faint of heart). It’s kind of the last resort method since it’s so intense and it will remove the surface protective coating from the iPhone case, which is exactly what you do not want to do in the aforementioned methods. Does an iPad Need Scratch Protection? Tooth paste does work pretty well and so does auto wax and polish. There’s no way I’d take sandpaper to my iPhone though. I’m not sure I care enough about a scratch on the back of an iPhone to risk taking sandpaper to it. Very good. So good that it removed the Apple logo as well…. it dose with just a little drop of the wax, let it set and buff in round motions with a micro-fiber cloth. do it a few times for about 20 minuets and your iphone will be flawless. unless it was already very scratched up badly then it may not take away deep scratches. just the light ones that u get from laying it on a table or something. Prevention is better than cure. All my hand gadgets are non-slip, thief-proofed, reversible-engineered to new condition, just after I purchase each one: camera, phones, netbooks, notebooks, tablets, etc. EITHER/ OR / AND … the following. 1) Put making tape on everything except the screen(s), buttons, inlets & outlets. This tape comes in different colors, different degrees of stickiness. Reverse engineer with methylated spirit soaked rags. 2) Silicon rubber, as above. Wide color choices. For disguising or making glaringly obvious. Clean before applying. Use thin layers, except corners, near important buttons, sockets. 3) Hot-melt (plastic) glue. As above in (2). Easier to remove than Si-rubber. Not as suitable to large flat surfaces, but workable. Tedious but quickly reverse engineer to mint condition. 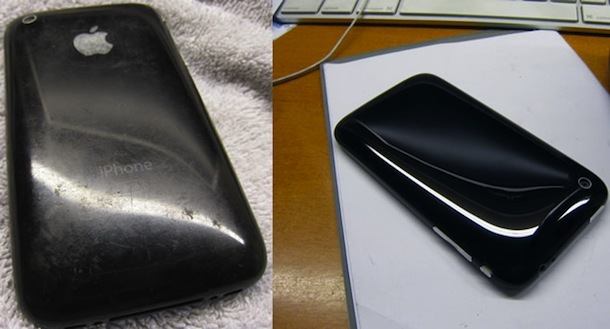 yea, it works if the phone is not too far gone…most people who want a scratch remover try it when their phone looks like that picture to the left, and think it will shine like the one on the right. it dont work that great. it will however remove scratches if they are light ones. like mine at the time only had a few little scuffs on the bottom where it says “iphone 32 gb” fron sitting on a wooden table. not deep gashes in the paint. but i lost that iphone and went back to my 2g16gb. the silver aluminum back plate is wayyy better than the 3gs i had. it dsoe not get scratched up an has a better feel to it too. Google is your friend. Many people have made things worse using toothpaste. Apple says damp lint-free cloth is the only recommended way to go and I believe them! Of course, that doesn’t get scratches out. I used 3000 grit sandpaper on my 7 plus when I discovered a scratch on the signal strip. It worked perfectly.